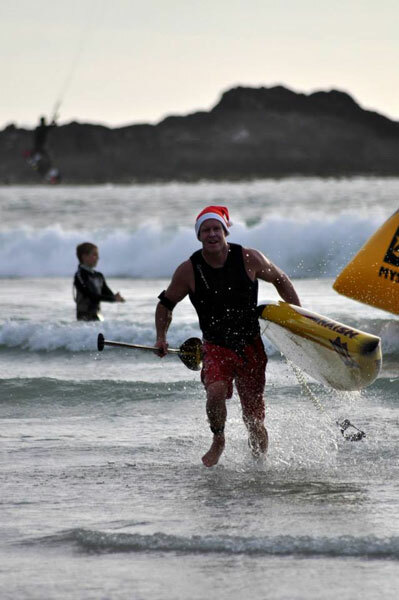 The 2013 PRIMI Naish Downwind Championship decider was held at Woodbridge Island, Milnerton on 11th Dec. 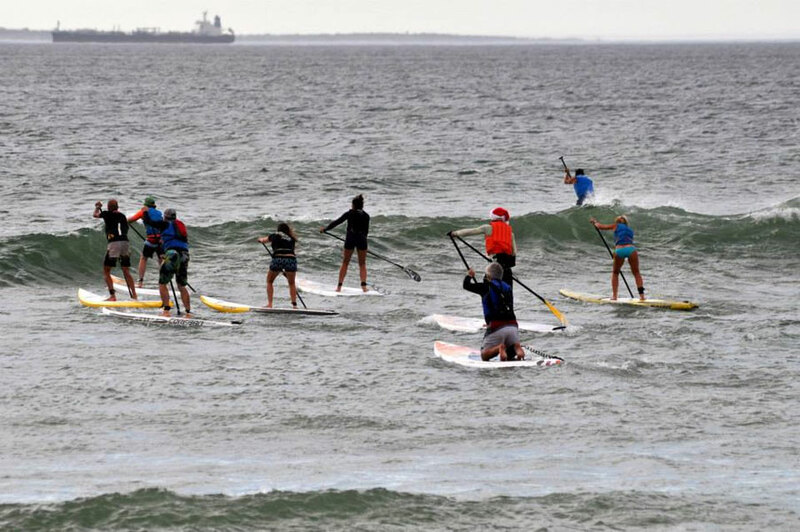 The race takes the paddlers 10.1km downwind to Big Bay. Conditions were very contestable with 17-23knots of wind and no swell. As the country mourns the loss of one of the worlds greatest leaders, our paddling fraternity dedicated this paddle to the life of Nelson Mandela and held a one minutes silence prior to the start in his memory. It was quite emotional event having Robben Island as a backdrop, just trying to fathom how Madiba managed to come from incarceration to making such a profound difference in all of our lives – Respect. 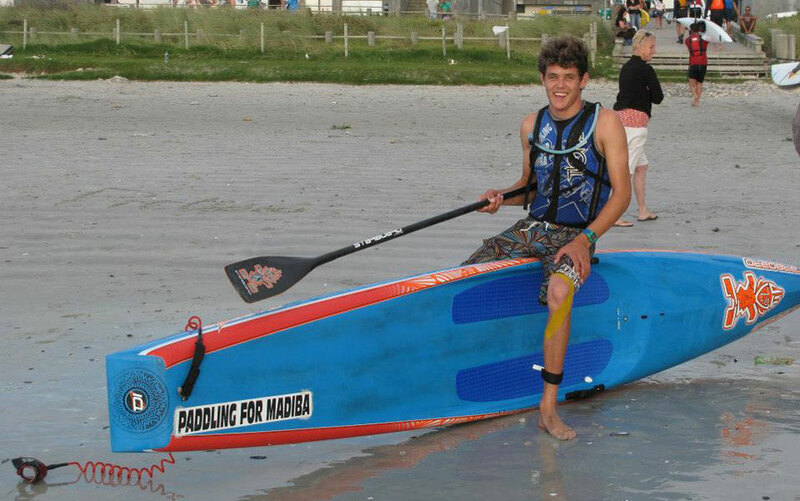 But back to the paddling – Dylan Frick was holding the lead going into the 10th and final race of the season. 4 races were cancelled due to lack of wind but fortunately the weather co-operated making it our 6th completed race this year. Ethan Koopmans was only 2 points behind in the championship and after last weeks photo-finish it was a hard one to call. Ethan has been improving in the lighter winds and this weeks conditions were sort of in between. There were lots of runs, but anything under 25knots is considered weak by Cape Town standards, so Dylan was definitely the favorite. The battle for the lower placings was pretty much over so all the focus was on the lead pair. Ethan needed two paddlers to wedge themselves between himself and Dylan to take the championship – a tall ask after the pair had dropped the field by 6minutes last week! First start saw Armien Wohlgemuth fly onto the runs with Brigette van Aswegen also making a nice impression. The leading lady, Mishka Steyn, got off the beach around midfield and had some work to do. Armien led the first batch from start to finish and ended up in 8th overall with a time of 56.22. Mishka caught up to Brigette and took over 2 minutes out of her – and claimed her first PRIMI Naish Downwind overall title! Mishka is only 16yo and has now finally broken Brigettes stranglehold on the downwind discipline. Mishka now holds the Overall Ladies title as well as the Junior Ladies title – well done Mishka! The first start had some epic close battles with amongst others Sean Avni and Nico Pfitzenmaier being literally side by side the entire way in a battle that eventually swung in favour of Nico. Nico is a multiple mountainbike champion including the current World Cross Country title – so there is a weapon for you! Sean reckons Nico had a little more left in the tank at the end….and yes, we wouldn’t argue with that…. Another noteworthy performance came from a first timer who had only ever done 2 downwinders prior to his first race. It was with some trepidation, as he was convinced he’d seen the landlord on his training run earlier in the week – but with dad on hand to chaperone our youngest competitor to date, 9yo Cameron Tripney, took to the seas and conquered, 1hr14min and 31st overall – and he weighs 27kg!!!! Brilliant cricket! Some of you may have seen the video we posted earlier in the year of his maiden run – if you haven’t, do yourself a favour and watch it now – it’s a hoot! In the second start Dylan, as always, got off the beach in a hurry while Ethan dropped it going over a 2ft wave. Peter Petersen quickly filed into 2nd and tried to hang onto Dylan while eying Ethan catching up and taking over the pursuit duties. Brad Adams was hanging in 4th on a slightly wider line with Joshua Robertson close by. Dylan paddled like a man possessed and by halfway he’d built up a sizeable lead on Ethan – there was no way anyone would wedge themselves between Ethan and Dylan and Ethan did not look like he was in a position to close the gap. This meant that by halfway Dylan had pretty much cemented his position as the Downwind King of 2013! Dylan won in 48.54. With Ethan taking second in 50.33…Peter Petersen claimed 3rd in 52.55 holding off the youngsters barking from behind. Excellent performance from Dylan Frick who keeps posting the results – and he is our new Overall Downwind champ 2013! Ethan’s 2nd place overall puts Joshua Robertson into 2nd place in the Juniors while a welcome return from injury saw Kimon Dos Santos take 3rd. This would also be their order in the overall series ranking – so well done Ethan, new junior champ! 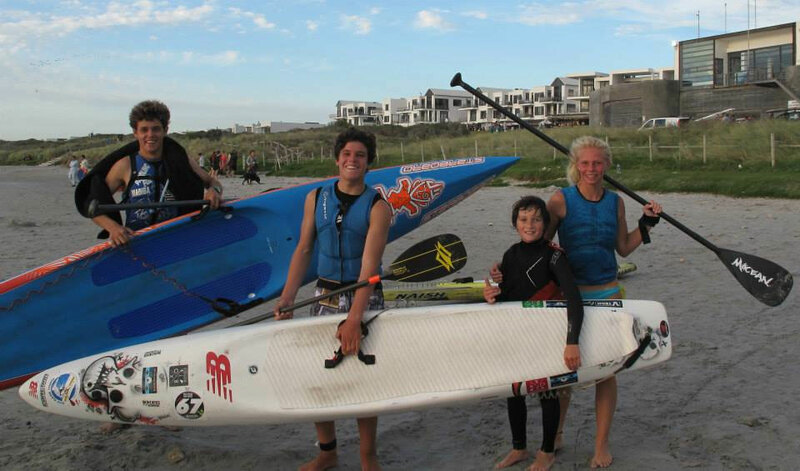 Ethan also claimed 2nd overall in the Open category while Joshua Robertson took a fine 3rd overall – well done juniors. In the masters Peter Petersen cemented his masters title with a category win and 3rd overall while Gary van Rooyen was runner up in 6th overall. Third Master was Armien Wohlgemuth with his 8th place overall. Pietro Muscas takes second in the masters overall ranking, while Rob Munro’s consistency sees him take a deserved 3rd overall. Monika Wohlgemuth improved on her husbands fine performance and took out the Lady masters race and title with Maleen Hoekstra once again taking second. Overall Patricia Kohrs managed to sneak ahead of Maleen to take 2nd – well done ladies – you guys rock! That concludes our 10 race PRIMI Naish race series – we ended up racing 6 out of the 10 weeks and had 60 paddlers ranked. We’ll be back next year when the new 10 race series starts on the 8th of January.